“Stinkin’ Thinkin’” is often rooted in a number of different sources – father wounds, mother wounds, traumatic wounds, bad church experiences, our sinful past or hurtful experiences. If left unchecked or unresolved, inevitably God will be blamed. The Lord is for me. He’s not against me. He doesn’t have it in for me. He’s not a cosmic killjoy. God knows what’s best for me. And, He wants what’s best for me. 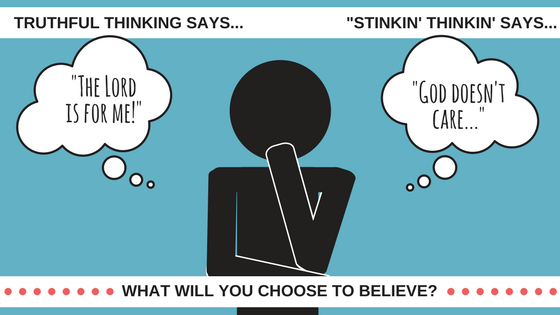 Consider how "stinkin' thinkin'" could affect your marriage... What are you believing about your spouse? Are you letting bitterness and anger guide your thoughts? Or are you letting the truth of God's word guide your thoughts? Our quickness to forgive and show grace to our spouse does wonders for our thought life, but if we harvest sinful thoughts and unforgiveness toward them, the enemy will have a field day with our thought life. We must walk in the power of the Spirit, choosing to believe what God says about us and our spouse, in order to overcome "stinkin' thinkin'" and love our spouse in a way that honors God.